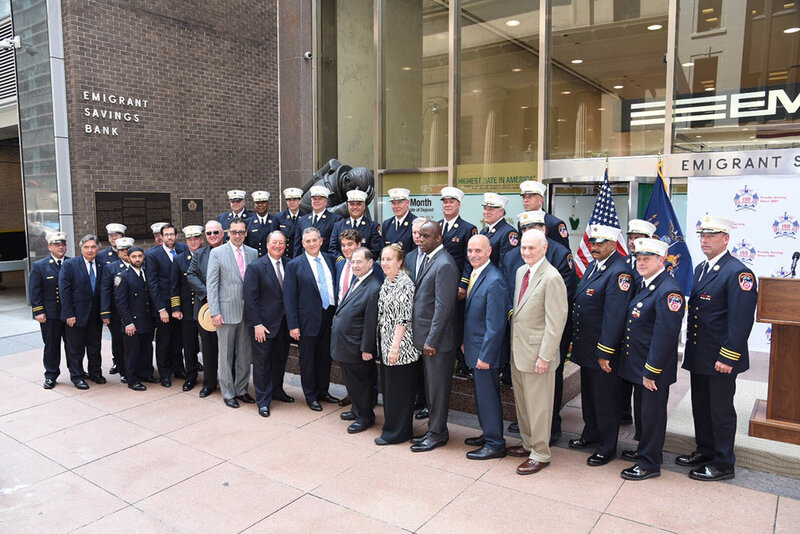 The New York City Fire Department’s (FDNY) 150 years of service to the city was celebrated at the Kneeling Fireman statue outside Emigrant Savings Bank headquarters. 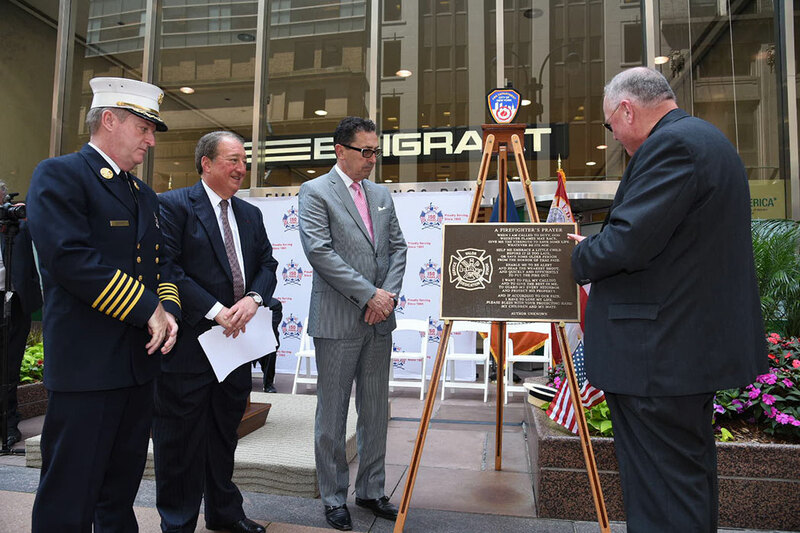 Emigrant Savings Bank Chairman Howard Milstein presided over the ceremony at which a plaque commemorating the anniversary was unveiled. Also participating were Commissioner Daniel Nigro and Cardinal Timothy Dolan, who blessed a plaque of “The Fireman’s Prayer” presented to FDNY headquarters. “This statue will continue to be an enduring symbol of September 11th, but today it becomes even more of a timeless image, as it represents all those who have bravely served for a century and a half,” Nigro said. In his remarks, Howard Milstein recalled an earlier anniversary marked at the same location. “The last time we gathered here to honor our Fire Department was in 2011. It was the tenth anniversary of 9/11—a difficult time of recalling searing memories and our irreparable loss,” Mr. Milstein said. “We marked that occasion by dedicating the statue of The Kneeling Fireman. The statue, which depicts a firefighter on bended knee, arrived at JFK on September 9, 2001. It was intended to just pass through our city. But it was stranded here when air traffic was halted after the 9/11 attacks. Originally intended for the Firefighters Association of Missouri, it was donated by them to the residents of New York in recognition of our City’s losses. “In the days right after the attacks, we placed the statue outside our hotel, the Milford Plaza, which was helping first responders with accommodations, food and supplies. It stood as a beacon for firefighters and first responders from across the nation who came to help. The statue became a makeshift memorial. Thousands of New Yorkers and tourists left candles, photographs, prayer books, flowers and private notes. “This statue now has a permanent home, here, at the headquarters of our family’s bank. It’s the only memorial in Midtown for all our fallen first responders. There’s not a day that goes by that people don’t stop and pay tribute to the heroes that the statue honors. Part of that tribute is the poignant ‘Fireman’s Prayer’ at the foot of the memorial. A prayer that embodies the firefighter’s spirit of selflessness, dedication and service.